Smokey Bear says it all. The title of the 1966 surfing film is intended to generate visions of eternal surf and sun—a surfer’s Shangra La, but the Endless Summer we’re experiencing during what is suppose to be winter this year is more like hell than heaven, and there hasn't been any surf in weeks, either. It was 82 degrees in the parking lot of Malibu City Hall at 9:30 p.m. on Wednesday, January 15, and 84 at Pepperdine University at 8:30 p.m. on Thursday. After what feels like an eternity of gale-force winds, the Santa Anas have diminished today, but the red flag warning is still in place. 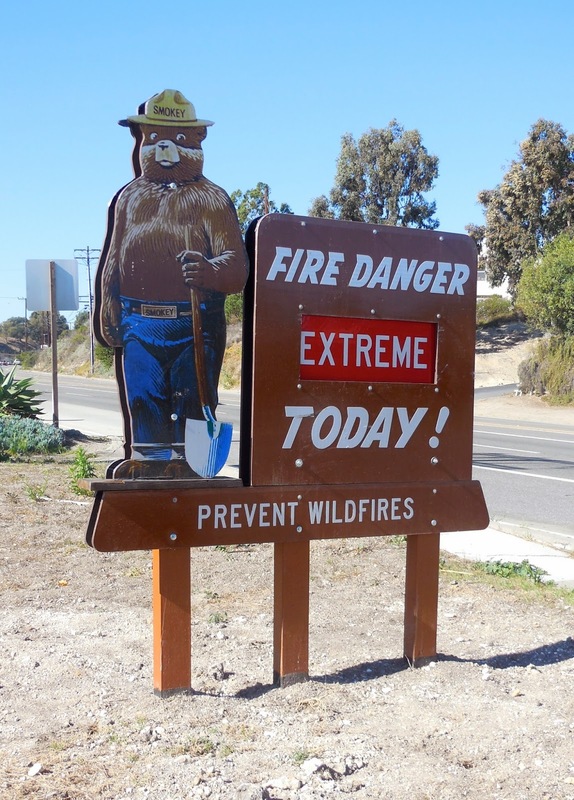 After weeks of wind and fire danger, everyone in wildfire danger zones—and that’s most of Southern California these days—are feeling not so much nervous as exhausted. Smoke from the Colby Fire and news footage of burning homes is a reminder that the danger is real and constant. That fire, like the catastrophic Corral Fire in Malibu in 2007, was started by an illegal camp fire. 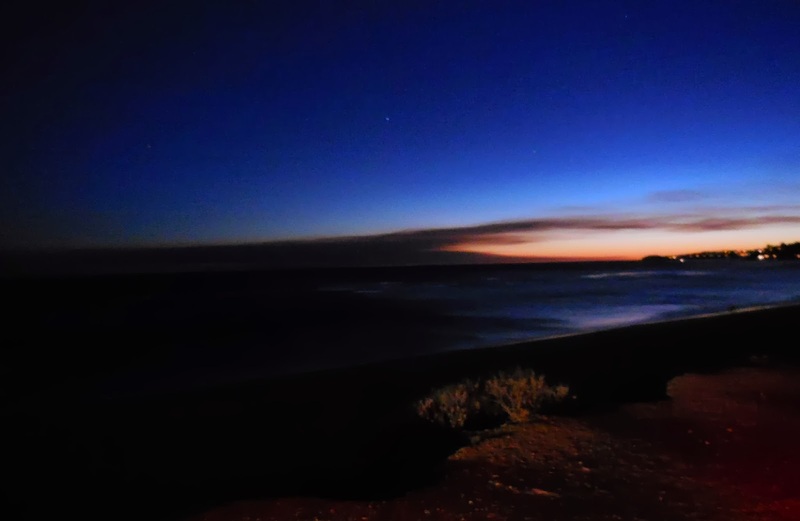 Smoke from the Colby Fire, more than 50 miles away, drifts past Point Dume. We've only had a quarter inch of rain so far, not enough to wake the giant coreopsis flowers from dormancy or even generate the growth of winter grass. I am reminded of Fredrick Hastings Rindge's description of the great drought of 1863: "In November, 1863 there was a regular downpour, and it did not rain again until November, 1864." Smoke from the Colby Fire turns sunset sullen and ominous on the evening of January 16. The wind was so powerful at Corral Beach that I couldn't hold the camera steady, even with the monopod. I had to lean on the car to get this shot. Humans aren’t the only ones feeling the stress, the drought and heat are impacting local wildlife, too. Snakes that normally hibernate are active. I spoke to a woman on Wednesday who found four rattlesnakes on her porch last week. Gophers, desperate for green food, are eating things they normally leave alone, including inedible bulbs, like narcissus, and even bitter and tough pomegranate, citrus and oak roots. There have reportedly been nine incidents of pet animals attacked or taken by coyotes in the Point Dume area in the past two weeks. Coyotes, desperate for water and food, are taking chances that they would never take during a normal winter. The consequences are tragic for pet owners and ultimately for the coyotes. Coyotes are increasingly coming into conflict with humans, as the drought forces them to seek food and water in residential areas. Residents can help prevent conflict by making sure small animals are not left alone outside, small dogs are walked on short leashes, instead of retractable leases, gaps in fencing are closed, and potential attractants like trash cans, BBQ grease, fallen fruit and birdseed are removed. 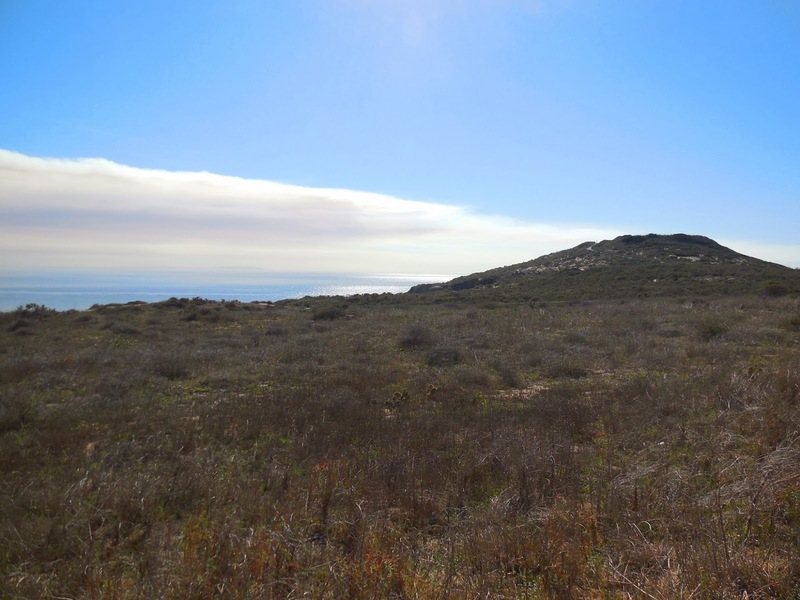 I wrote this piece for the Malibu Surfside News on coyotes a couple of weeks ago. 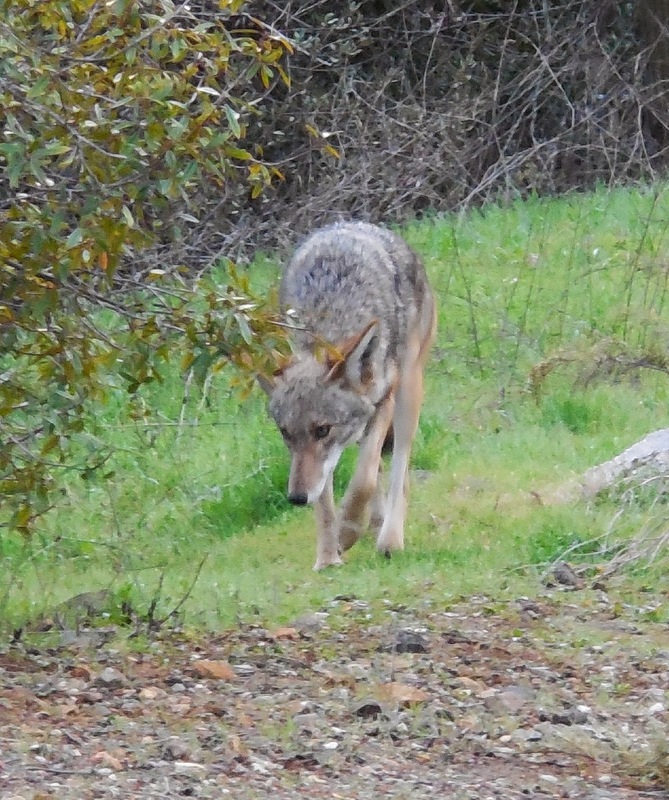 I talked to Camilla Fox, executive director of the Coyote Project, for the article. Her organization has excellent tip on how to safely and humanely keep coyotes away, available here. 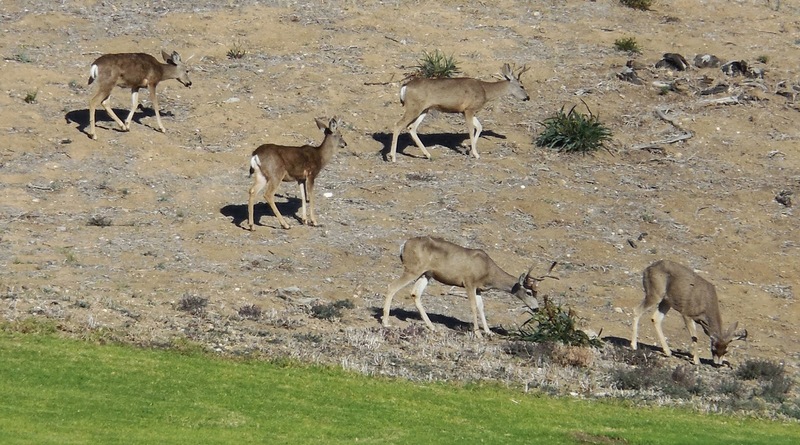 Like the coyotes, deer are also moving into developed areas in search of green food and fresh water. This is the Pepperdine herd. These animals are usually sleek and appear healthy but looked a bit seedy this week. The one major thing residents can do to help the local deer population is to stay alert when driving and especially to slow down at dusk, when deer—and other animal jaywalkers, including skunks, are most active. While no one wants to encourage coyotes, a safe, clean, consistent water source that is far enough off the ground to discourage coyotes and other interlopers, can be a tremendous help for wild birds. 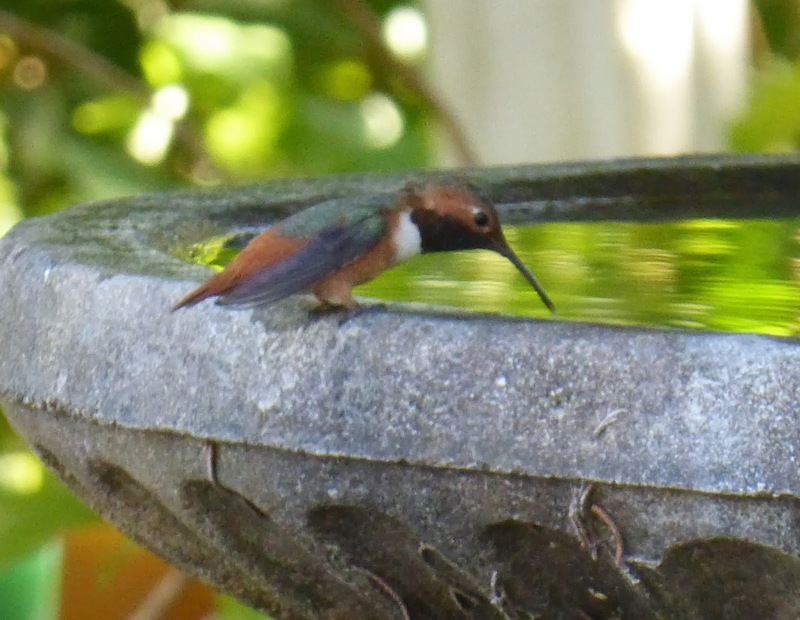 Even this rufus hummingbird has been showing up at the backyard birdbath this week. The dew that hummingbirds usually depend on for hydration is in short supply. 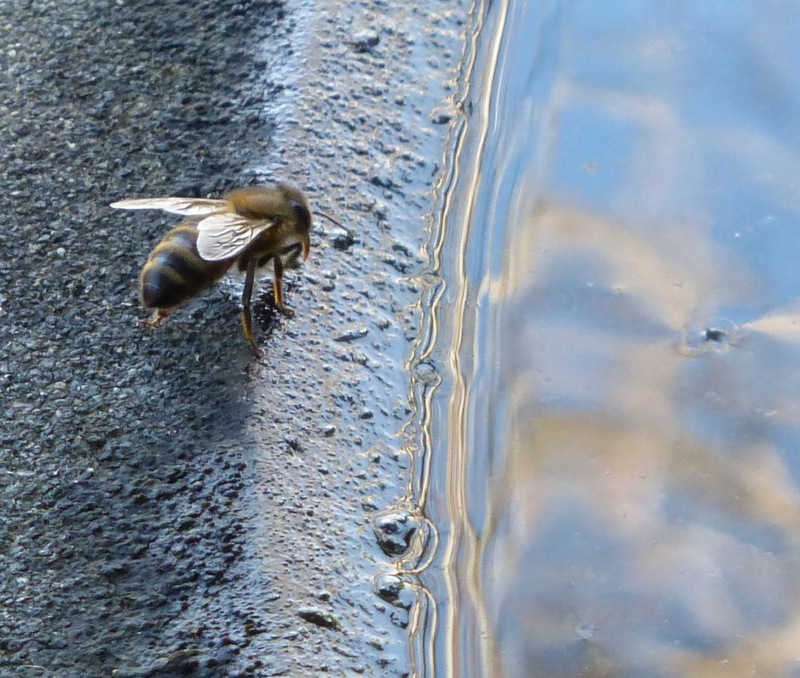 Honey bees and other beneficial insects also benefit from a safe water source. NOAA is forecasting at least 10 more days of high pressure and a possible return of the Santa Anas next weekend. We can only hope February and March will bring much needed rain, and that endless summer will give way to winter at last, and the hope of spring. 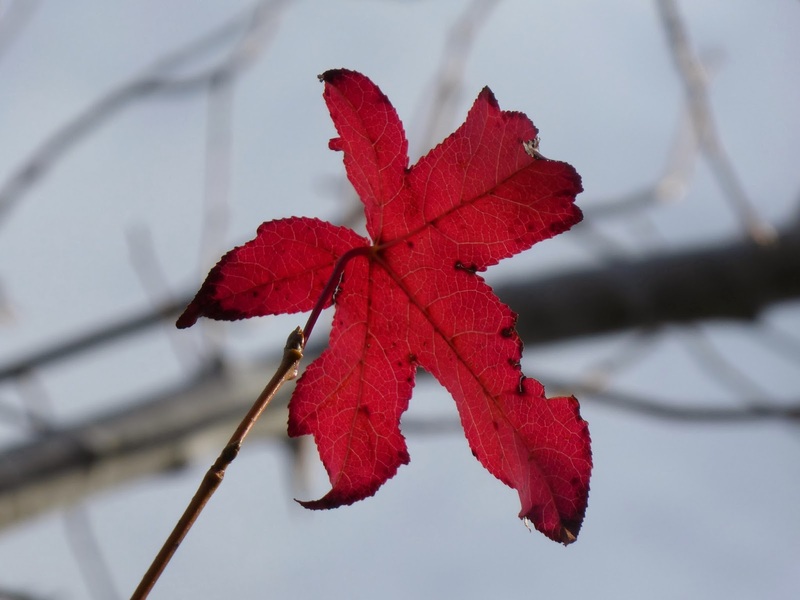 This is the last leaf of autumn in our garden, clinging stubbornly to the otherwise bare liquidambar tree through all the gale force Santa Ana winds of this crazy un-wintery winter.